It’s not just a race. It’s a magical experience. 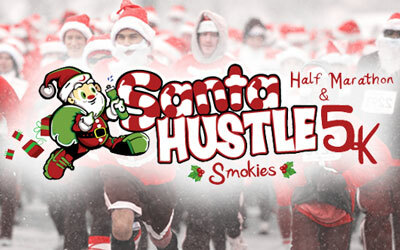 Come join the Santa Hustle magic on Sunday, December 9, 2018 at The Wilderness Resort. The 5K run/walk will begin and end at The Wilderness at the Smokies Resort and Waterpark at 7:30 am. Participants will receive a Santa hat and beard, a performance hoodie and a 5K or Half Finisher medal. The top 3 male and female finishers in each age group for each race will receive a customized Santa Hustle medal. The top 3 overall males and females will receive a personalized award. An awards ceremony will take place after each race. There will be a post race party at the Wilderness outside in a heated tent. Runners will enjoy free milk and cookies, as well as holiday music.